This DIY project was inspired by the new Roland BT-1 Bar Trigger Pad. For those that don’t know Roland announced at winter NAMM 2013 a new bar trigger called the Roland BT-1. This new bar trigger has a really cool feature for Roland module users that makes it imperveous to cross talk (Xtalk). As cool as this feature is, some edrummers don’t like the fact that it uses an entire TRS connection for a single zone Trigger. After all, a TRS input normally means a dual zone trigger. Without getting into too much detail, the Roland BT-1 is seen like a piezo/switch cymbal trigger (which is why it needs the full TRS input connection). When using it with a Roland module, the BT-1 is just the switch zone of that cymbal trigger. Being used in this way, gives the BT-1 the ability to have zero cross talk (Xtalk). As a non Roland module user (I use an Alesis DM10) I would love to have a zero Xtalk bar trigger. I would also like to be able to use two of them on one TRS input (no need to waste a perfectly good dual zone input). The good news, this can be done for the non Roland user. It will require a slightly different approach in the electronics to make it happen. The DIY film switch [see: Get a Choke Hold (eCymbal Choke Switch) for reference] would be mounted in a manner that would make it the strike zone of your bar trigger (covered with a rubber guard of some kind). The Piezo would be mounted within the bar trigger enclosure itself. The bar trigger would not send a signal to the module until the switch is struck. The purpose of “Resistor #1” is to keep the piezo from building charge do to Xtalk. Failure to include this resistor could cause a max velocity signal triggered every time the switch is closed do to the excess charge build-up from crossTalk. “Resistors #2” is used so my Alesis module does not have a hanging zone (which could cause false/ghost triggering). When the switch is closed, the electronic signal takes the path of least resistance and for a very brief moment the module sees the piezo as any normal trigger pad. I have not built a bar trigger in this manner yet (I will update this post once I do), however I have used this exact circuit to upgrade my DIY pedal trigger [see: DIY Pedal Trigger (Similar to FatKat) for reference]. I’m hoping to update that project in the near future as well. Using this method of Xtalk isolation could make it possible to build an entire electronic drum kit that is 100% free of Xtalk. That is, as long as you don’t mind your edrum kit being all small rubber pads. My only real hands-on experience with a Roland module was with my old TD-8. That module has two TRS inputs that could be used with the HF-1 Bar Trigger. Input 1/2 (KICK 1/2) and Input 11/12 (Aux1/2). 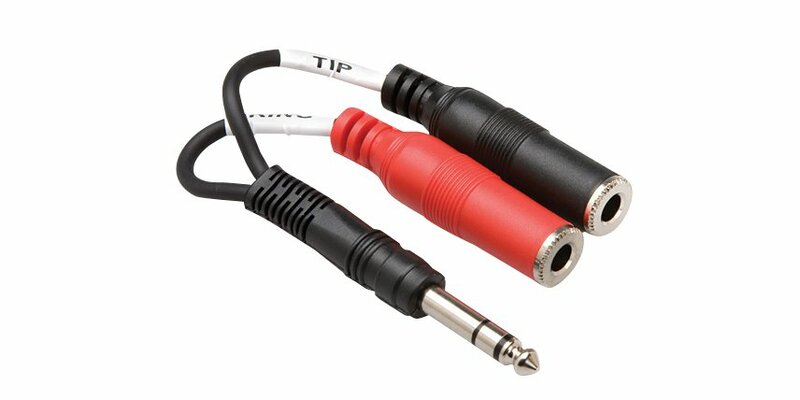 Those two particular inputs allow for a standard 1/4″ stereo splitter to be used. So if you have a Roland module which has an input that allows for two independent single zone triggers (meaning your don’t need the special Roland splitter adaptor) you should be able to use this as well on those inputs. Also, I’m not 100% sure that Resistor #2 is needed since I no longer own a Roland module and can not test. 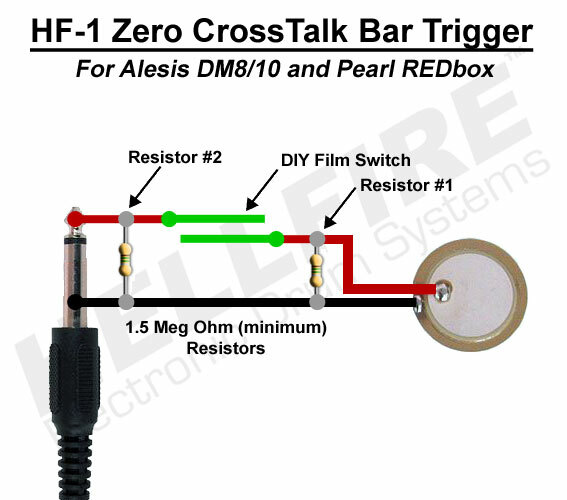 Now you can have two zero cross talk bar triggers on one TRS input. Thanks for this design ! Could you tell me if it’s good ? I think to use it with the alesis trigger I/o… it should work ? do you think this design work on alesis trigger i/o ? Yes, it should work with the Alesis Trigger I/O. That looks like aluminum tape. What you need is a thin aluminum sheet metal. I hope that helps. Sorry for the double post, and thanks for your help. I will search for sheet metal. Cute idea, but won’t work. Thing is, a quick hit might only close the switch for 1 ms or slightly more. The piezo signal is much slower. So the module only “sees” a fraction of the signal (and probaby at the wrong time)l. That’s why you need the TRS to get the peak piezo level separately from the swich close. Cute comment, however it DOES WORK! I used a very similar circuit for Alesis DM10, Pearl REDbox Velocity Switch Zone. The only difference is the lack of one resistor. There is also a video with that project to show it working as well. Thanks for your comment. Maybe it works under certain optimal conditions. And of course it depends on how long the switch is actually closed. I have seen as short as 1 ms on cymbal edge switches. Hardly long enough to “catch” the peak of the piezo signal. Also, the link you refer to, has the piezo always “active” on the ring. So the module can “find” the peak level. Great if the DIY BT1 works, but I doubt if it’s consistent and reliable. ps. Very nice web site you have here, thanks. Please keep in mind that the HF-1 is designed for single zone input or dual zone inputs that are not dependent on each other (Which is how all dual zone inputs on the Alesis DM10 work. So, the HF-1 is primarily designed to work Alesis modules). Therefor it doesn’t matter if the ring zone is “active”, because each zone is totally independent. I’m not sure if you actually watched the video in the link I gave you, but the switch is shown to work quite well. Also, I use this same switch circuit in my pedal trigger (to eliminate floor vibration) and I can state unequivocally it is very consistent and reliable (and that circuit only uses a TS connection). I’m glad you like the site. Thanks again for your comments. UPDATE! $1499.00 for the Alesis DM10 Pro Kit!